Horror comedies have always been a curious little subgenre. On one level it makes sense - truly great humor and truly great terror both rely heavily on timing and build-up to work. Beyond that, it's hard to imagine two entities more different. Most "horror comedies" end up being just one or the other - with elements of the opposing genre splashed in for texture. It's always a great pleasure to find a film that is both funny and scary at the same time, without one diluting either effect. Shaun of the Dead is one of those pleasures. 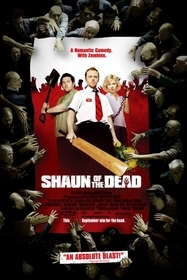 Shaun (Simon Pegg) is a loser with no prospects. Every night, he drags his girlfriend to the same local pub, the Winchester. Every morning, he drags himself to a dead-end job in a London electronics shop. 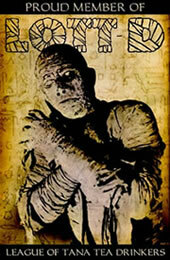 Life just shambles along... until the dead start shambling along with it. Shaun decides to grow a pair (although not a very big pair), grab his girlfriend, and make for the Winchester with a motley crew of bickering survivors. There, he plans to hole up with peanuts and a pint until this living dead nonsense blows over. The brilliance of the screenplay (by Pegg and director Simon Wright) is that it rarely treats the zombies as anything less than the terrifying hordes imagined by George A. Romero. They attack en masse. They kill people. They rip people apart. Indeed, you could see this film happening (almost) concurrently with Dawn of the Dead (1978). It's the characters that create the comedy. Unlike other zombie movies, none of these people are stoic and serious. They're human and they react as anybody would - with mad panic or complete denial. There's a running joke with Shaun's lowlife roommate Ed (Nick Frost), who is constantly trying to do the things he would usually do in his day. Problem is, Ed's habits tend to involve making lots of conspicuous noise, and he always does the dumbest thing at the worst possible moments. You can't help liking him, though, because he is a doof, and a well-meaning one at that. And that's the success of Shaun -- it's like taking a zombie movie and a romantic comedy (involving Shaun's tumultuous relationship with his girlfriend) and then running them both concurrently. The danger is always present (and there's some really Romeroesque moments splashed throughout), but the characters always maintain their ability to entertain. It's almost because of the danger that the characters become so endearing. When pushed to their limit, the main characters become much more interesting (save for the intentionally dour party-pooper played by Dylan Moran, "Black Books"). Of course, because this is British humor and slightly madcap at that, there's little jokes tossed in that are just there for a guffaw and little else - like the fight scene choreographed to Queen, and the rubbishing of Danny Boyle's 28 Days Later. Shaun of the Dead is going to be great fun for anybody - horror fan or not. However, it's the horror fans who win the most at the end of the day, as the in-jokes and extra little touches make this movie shine more than any other run-of-the-mill horror parody. There's love in this film. Love for the characters. Love for the genre. Love for human flesh being ripped apart in unique and bloody ways. What else could you want?